A flickr album has captured a side of life of the feared drones known as Storm Troopers from Star Wars fame that is normally not seen by outsiders. 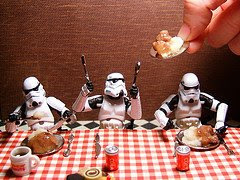 Go here to see what Storm Troopers do on their spare time. They don't seem so scary now! I personally liked the ones that included Dr Who figures.